There are foods that I like to splurge and treat myself to now and again. 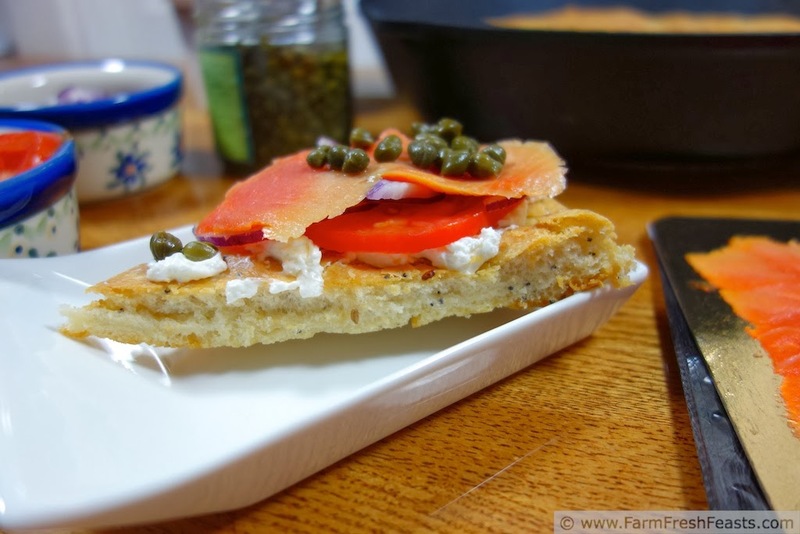 One of them is a good everything bagel, toasted under the broiler then spread with cream cheese, topped with lox, red onion, capers, and--if they are in season in my garden/the farm share--a slice of tomato. Like Albert in the book Bread and Jam for Frances (Amazon affiliate link) I set my meal up just so, and it makes me happy. 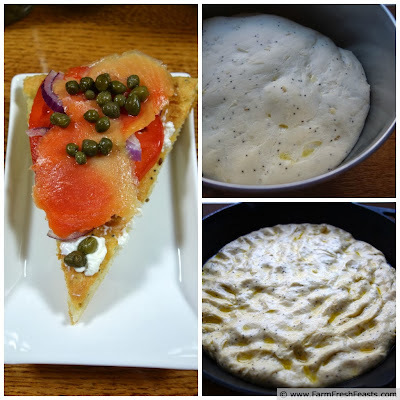 The first time I tried to recreate my treat on a pizza, one year ago's Potato Smoked Salmon Red Onion and Caper Pizza, the pizza, while tasty, missed the mark of what I wanted to capture. 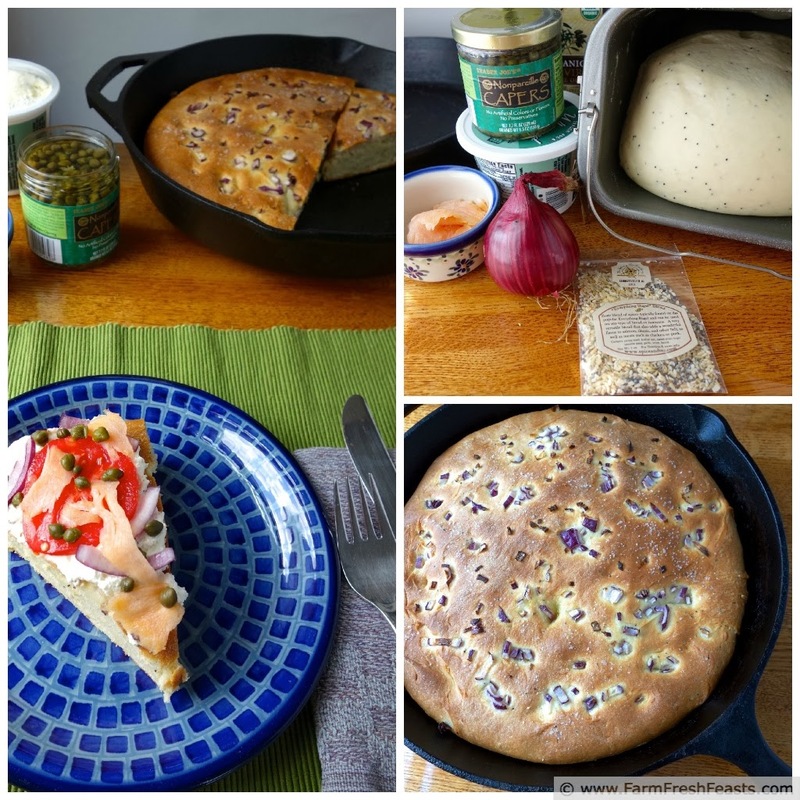 When I first made a focaccia I realized what I'd wanted was the chewiness of the crust, and made a mental note to find Everything Bagel seasoning and try it out. Fast forward to summer. While at the beach at a spice store steps away from the boardwalk (I'd think that wasn't a great location, but they got my business) I found it. As I drove back to Ohio I had my daughter take notes of all the recipe ideas in my head. 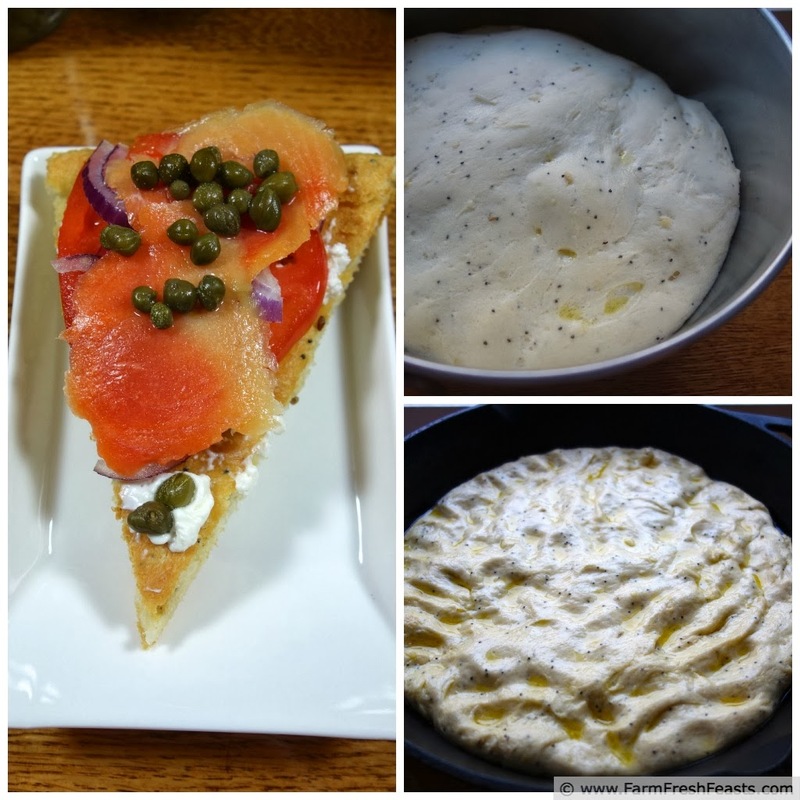 The first one I tried was Everything Bagel Focaccia. It was good--but still needed some tweaking. First try--too thick, and not "everything" enough. Third time was the charm for me (and for you! ), and I present you with a focaccia flavored like an everything bagel yet not so messy (I hate all the crunchy bits that fall off, though they are tasty scooped up and secured with cream cheese), safe to eat if your parents have invested much money in your mouth and don't want you to screw up your braces, and the perfect set up for a late brunch bar with assorted toppings. For my birthday I'd like to share a Friday Night Pizza Night version of one of my favorite foods. Enjoy! Please refer to my Pizza Primer post for general tips on making pizza doughs at home. In a large bowl (I used my stand mixer) mix all ingredients on low with a paddle until a ball of dough forms, scrape off the paddle then mix another couple of minutes on low until the ball is smooth. I don't use my kneading hook for this, but you can if you like. Let the dough rise for an hour in a warm place. Press into a 12 cast iron skillet (using a 10 inch makes a thicker focaccia and we preferred the thinner one). Let rise again for 30 minutes, meanwhile preheat the oven to 400 degrees Fahrenheit. Dimple the dough with your fingers (for focaccia-specific tips please see my first focaccia post), spread with bits of roasted garlic, sprinkle a couple of healthy pinches each of everything bagel seasoning and kosher salt. For me, a couple of healthy pinches means that I take my thumb and 2 fingers and dip into my salt dish or the seasoning bag, and grab what I can in my fingers then scatter it across the surface. And repeat until the surface is covered to my liking. Bake for 30 minutes at 400 degrees Fahrenheit, then cool on a rack. Slice (affiliate link to my favorite slicer) and serve. What's your favorite birthday treat? What's your favorite bagel topping? What do you think of the orthodontist adding bagels to the Naughty Foods list? Happy Birthday!!! Now I'm craving bagels (I'm more of a poppy seed girl-don't go for all that onion and garlic! 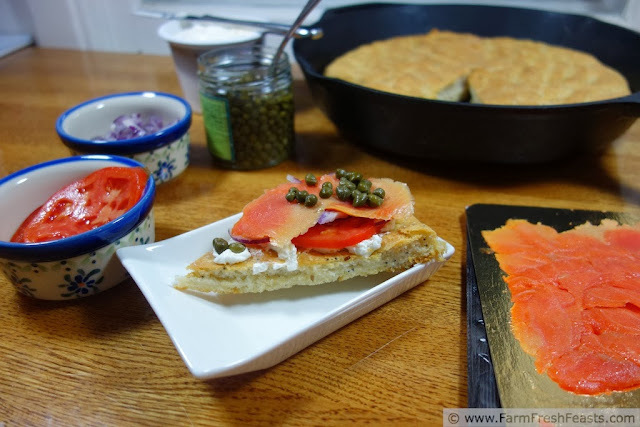 ), lox, and CC, but the closest I can get here in old Calvert County is a donut and some flabby, pale Salmon. Ugh. But happy birthday, really! And that orthodontist is the spawn of Satan and probably anti-Semitic! Thank you thank you thank you! It's not like you're on an island, you know. Good bagels are not that long of a drive away. And as for the dentist--nope, I'm pretty sure he's neither of those things. Just looking out for his work to stay in good shape. I have been baking in cast iron and loving it. Maybe on my santa list this year! Besides focaccia, corn bread is another 'must bake in cast iron' for me. I hope those reindeer get extra rations to haul cast iron around in the sleigh. I couldn't read this post after my Everything Bagel obsession two weeks ago. I needed a moment. You understand. This is also why you shouldn't deny yourself life's little pleasures because you'll end up going off the deep end later. This sounds delicious, although I will miss the messy bits falling off the top. They were a pain, but once secured with cream cheese, completely worth the mess. This coming from an OCD type too. I totally understand. And I can relate to securing the messy bits with cream cheese. BTDT. My son and I have a date to go out for bagels once his braces come off--next month! !